Here on this page we have gathered simple tips and techniques on how to massage your baby. 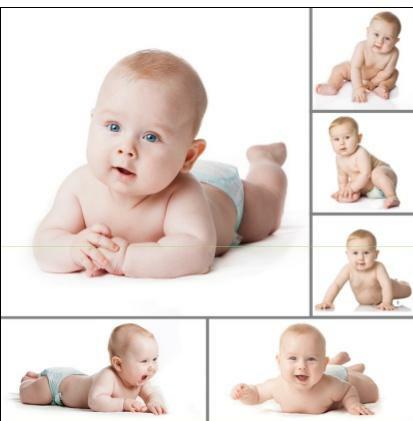 Experts agree to the fact that “Baby Massage” is an important aspect of an infant’s comfort and development. Daily baby massage is a great way of bonding with the baby. It also promotes sound sleep, relieves colic pain, enhances baby’s immune system, intellectual development and motor skills. Let’s see important baby massage tips here. Start a massage when your baby is all happy and cheerful. Apply the baby oil on a small area first and check for any irritation. Start with a HELLO stroke! Massage abdomen with fingertips in clockwise motion. Use your pinky to paddle across baby’s belly. Do the I LOVE YOU stroke repeatedly. Gently push the legs towards her stomach holding baby’s feet and knees. Rotate the hips few times. Walk fingers around navel clockwise. Use both of your palms to gently rub the stomach. Use your index finger & thumb to massage baby’s ears. Make a heart shape with both index fingers concluding at the chin. Cradle baby’s head in your palm. Massage scalp with fingers as if shampooing. Avoid top of head. Stroke with your thumbs the part between its eyebrows. Also stroke the closed eyelids softly. Massage jaw in very small circles. Stroke bride of nose to the cheeks. From sternum to shoulders, stroke both hands outward. Use a crisscross pattern from to rub from side of hip to opposite shoulder. Trace a heart shape starting from sternum, up to the shoulders and down again. Relax upper arm of baby by tapping it lightly. Wrap your fingers on the upper arm and rub from shoulder towards wrist. Grasp arm with both hands, one above the other. Then gently rub in opposite direction from shoulder to wrist. Massage palms with your thumbs. Stroke top of hand from wrist to fingertips. Gentle pull & squeeze each finger. Use small circles to massage wrist. Roll arms between both your hands. Place baby on his tummy. Keep his hands in front of him. Use circular motion to massage shoulders & buttocks. Rub both your hands on the back simultaneously from neck to hip and upwards. Use fingertips to massage side of infant’s spine and up the other. Never press spine directly. Holding fingers like a rake, stroke down his back. Lift one of baby’s legs by the ankle. Relax it by tapping lightly the upper- thigh. Roll legs between your hands. Hold ankle with one hand and wrap other in C-shape around baby’s upper thigh. Stroke from thigh to foot. Just like wringing a towel, wring each leg gently. Use thumb-over-thumb motion for massaging heel to toe. Stroke the top of her foot. Gently squeeze and pull each toe. Massage around baby’s ankle using small circles.